The first is to baseline how many people are on our sites at certain times of day and what pages they are on. This kind of data is pretty easy to get from daily analytic tools and/or log parsing, but Chartbeat’s visual data displays make it easy to quickly pattern match how your traffic divides up to different sections of your sites. Other well-visualized data sets are page loading time, time spent on site, and country of origin. So pretty quickly you can imprint on your brain what your baselines are. At this point you can mostly ignore it. In fact I recommend that unless something changes more than 25% in any direction ignore it. As long as it has settled back down the next time you look it rarely is worth understanding. Chartbeat has some historical data so if you forgot a baseline you can see it, but I almost never go into the historical tabs. The second use then is to track real time aberrations. I consider this akin to deep-sea fishing. You catch a 15 lb. Fish, who cares. You catch a 25 lb. fish it’s neat, but just throw it in the cooler (sorry for the cold blooded analogy, but I hope you just liked that pun). But when you have a 450 lb. marlin on the line you want every advantage you can get. So we go right to Chartbeat. What page are they going to, who is sending them, what else are they doing, how has page load time degraded, how is time-on-site affected, etc. Then once that is grokked, you can just maintain an overview look of how many of them are still coming and staying. Yes all this data will be in your web logs in 2 to 24 hours, but you want to make the most of the whale on your line. Yes your system tools can tell you server loads, cache hits, cpu usage, but an editor can never make sense of that. So now you can have distributed decision making. We had a Digg hit coincide with a big e-newsletter and the editorial team was able to remove widgets and other processor intensive but non-critical embeds from the site getting hit and watch the page load time go down. The reason our team can respond so fast now is that we use Chartbeat’s alert emails to know when something big is happening. They have a range of alerts you can get, but the only ones we do are: Site traffic is above monthly average, and site is not responding. The first lets everyone know there’s a marlin in the line. We’ve even added this alert to our on-call system as it’s really nice when you’ve been woken up at 3am to debug a page to see the issue is a site’s being slammed by a digg like service from Australia. Sure saves having to do a full diagnostic review when you’re brain hasn’t started working yet. And we use the site downtime alert as a 3rd backup. Sometimes monitoring services get misconfigured and you don’t realize that every night for 15 minutes your site is unreachable. Now you will. A nice addition is the iPhone app Chartbeat just launched. Any webstat service that uses flash (chartbeat included) becomes mostly useless when viewed via a mobile browser. So now if I see an alert on the weekend I can open the app and check out the traffic. Did something get dugg? Next round is on me. Are 16 different IPs from around the world all hammering our register page? Time to duck out and make sure oncall coverage is available. 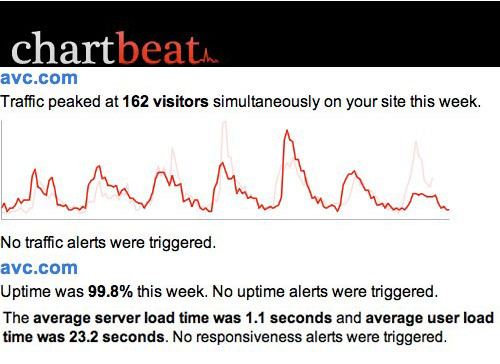 There’s probably a lot more we could use Chartbeat for, but with stat services less is more. We just want to know enough that we can ignore it or respond. So we take care before adding each new service that it’s something that will truly make a difference. If you like these kinds of topics I twitter them @tedr and blog them at blog.dogster.com. Dogster Inc. runs a network of pet-related Internet properties. We have sites for dog owners, cats owners, pet id and registry, cute and fuzzy lovers, pet deals, you name it. We even have an app so dogs can chat on the iPhone! 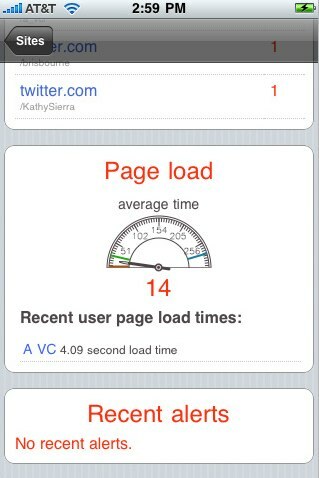 Chartbeat’s real-time analytics come to the iphone and more! You’re away from your computer when you get an alert on your phone that traffic has spiked to an all-time high. Was it random good fortune or did something happen, good or bad, to cause the spike that you need to get on top of? To ensure that you can access your real-time analytics in real time when you need them, chartbeat has released a free iphone app that can keep you in touch with the heartbeat of your site wherever you may be. How many people are on my site? How is my site performing? The app is available for free from the App Store, please let us know what you think! If you would like to see your analytics on the go but don’t have a chartbeat account you can sign up for a free 30-day trial here.